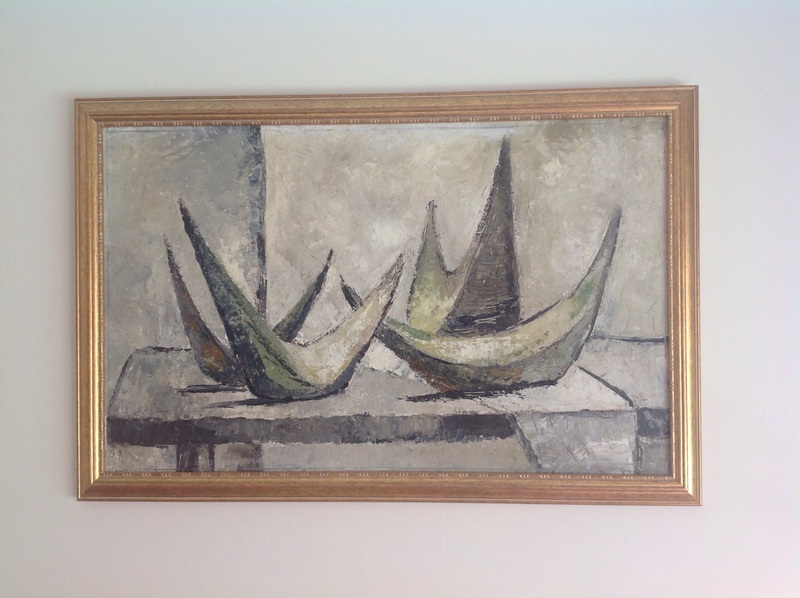 Thanks to social media tools, I am the proud owner of two works of art painted by my aunt in the mid-century. What’s the big deal about that? Well, I live in Delaware. My aunt was a teaching nun who lived and taught and painted, and sometimes exhibited, between 1950 and 1980, in Iowa, Chicago and later in her career, in the San Francisco Bay area. My access to her while she lived was loving, but limited, and after her death in 1980, our worlds remained geographically distant, seemingly for an eternity. I began to learn more about her as a part of a family geneaology project. I wanted to research her life as an artist. To complicate my search, as a nun, most of her work is owned by her convent and or the college in which she came of age as an artist-student and then later as an artist-professor. But in dialogue with them, I learned she exhibited many of her modern art paintings and sold many to private individuals. Her convent generously shared photographs of their inventory and gave me a few leads and archived documents that might help me to track down what I estimate to be at least 50 other works out there. My goal was to catalog them in a virtual gallery – in a website I created in 2010, called simply enough, nunartist.com. From the photos sent to me, I began to analyze some the paintings from the shared photographs and gathered as much detail as I could about her life, her artistic methodology and inspiration and imagined what the missing paintings and sketches, now hanging in private homes or galleries, might look like. My hope was to photograph them all and feature them on my WordPress website. I began to share my blog posts on social media. I posted my links to art galleries on Facebook and Twitter. I posted to alumni who listed the schools she attended or taught. I also posted on Twitter using hashtags like #art #modernart #Iowa #Chicago #SanFrancisco and on and on. If a social media site had “art” in the name, I followed them! My website was visited. People retweeted. Individuals started going up to their Picasso-like and Matisse-inspired paintings to see if the signatures were by my aunt. I got some hits! One strange turn of events was particularly fruitful and it’s an amazing Twitter success story, inexplicably involving Justin Bieber and Groupon! It earned me a new painting of my aunt’s that I can call my own, and a new friendship! Thanks to Twitter this painting by my aunt went from eBay to my dining room! Emboldened by this success, I created a Facebook page and a Twitter account featuring my aunt and my quest. I must confess that other obligations sidetracked me and I haven’t kept up with either, but for a year after their conception, both presences on social media brought me significant leads. People visited the website (about 10,000 hits to date) and I get contacted periodically by those who have been made aware of my mission and are kind enough to share a photo they have. It was never my goal to own her work, though I had always desired one. 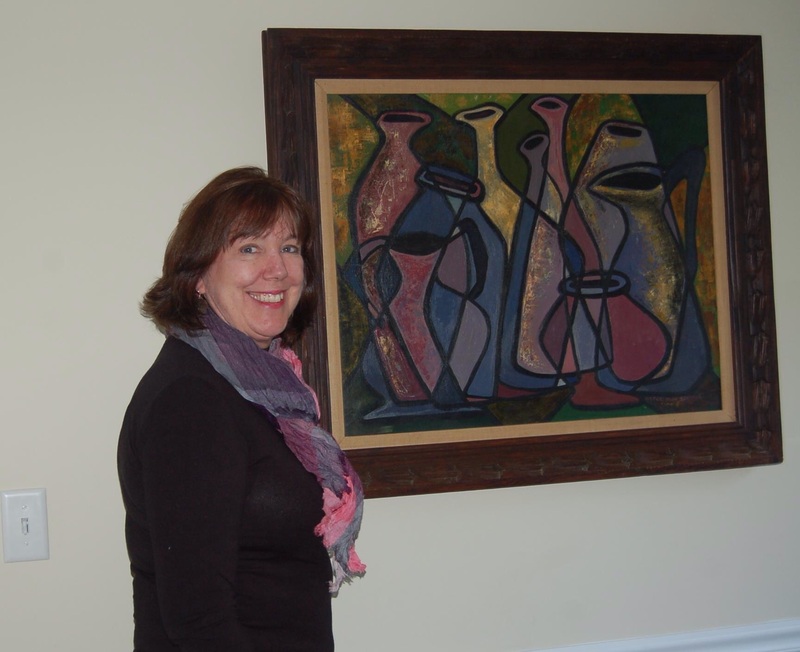 A woman who visited an auction house in Chicago spotted an abstract oil for sale and before buying it, researched the artist’s signature on Google. She came across my keyword-laden WordPress site and contacted me and said she thought this might be by my aunt. She gave me the gallery/auction website and let me have first dibs in buying it. So kind! Without social media and the array of tools available to me, I would never have had this unique and intimate connection to my aunt. I can see her brush strokes. I feel her near me when I look at them. Social media allowed me to stretch across the continent and make these contacts in a broad way. I am still hearing from people thanks to the technological transport of my inquiries. Had it been 1990 or even 2000, there’d be no story to share. No reunion to a unique part of my past and a special family connection. Social media has enormous power. My hopes and desires trekked across Twitter and fanned out across Facebook. I received in kind, a personal, emotional experience, exemplified in the kindness and curiosity of others! Social media has been criticized as being distant and impersonal. I found it to be the exact opposite – a bridge to real human beings across great distances where common interests unite and generous spirits share.